Jason Jennings is one of the leading voices and minds in the business and leadership community. Jason doesn't just right about business, he founded a consulting firm and leads by example. He will be on to discuss creating greatness and breaking free from the status quo. We are living through an incredible time and we are seeing the world change right in-front of our eyes. You can be at the forefront and Jason can show you how. He traveled the globe in search of the world's fastest companies for his landmark book, It's Not the Big That Eat the Small - It’s the Fast That Eat the Slow. Within weeks of its release it hit the Wall Street Journal, USA Today and New York Times Bestsellers Lists. Now published in 32 languages, USA TODAY named it one of the top 25 books of the year! 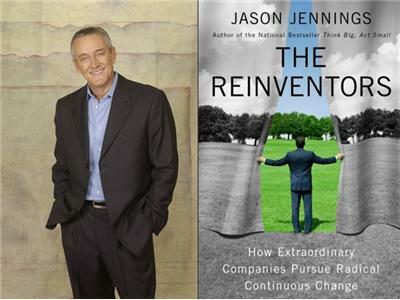 His latest book for his publisher Penguin Putnam, The Reinventors - How Extraordinary Companies Pursue Radical Continuous Change was released on May 10, 2012 and reveals the secrets of those leaders and organizations that have successfully reinvented and transformed themselves. In total, Jennings and his researchers have screened and studied more than 200,000 companies.